Sit, friend, and have a listen to a yarn or three of the man-mountain vice president, the Indiana goliath with David’s heart. 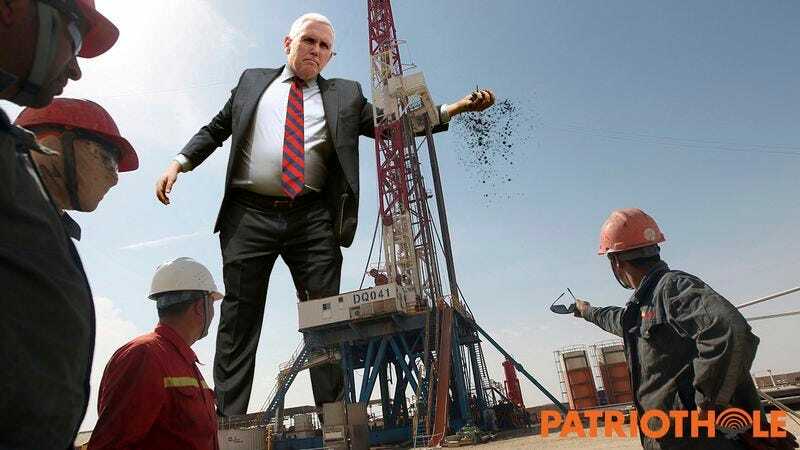 With redwood legs and boulder fists tough as his Christian spirit, Ol’ Mammoth Mike Pence proved time and again that the American worker had a friend in high places! 1. When Mike Pence juggled a strike to pieces: Well, they say some low-down spectacle-wearing socialist types had come out from the coast to stir the pot at old Mister Akerson’s automobile plant ’round Fort Wayne. Those boys set to work but fast, filling good Christian autoworkers with all kinds of university bamboozling, till they had them so addled up they were calling their own dogs “Comrade.” Before you could say “Zinoviev,” those poor workers were itching to strike. One bright Indiana morning, the autoworkers formed their picket line, but before a single chant had been chunt, who should come bounding over the freeway but Mile-High Mike, tie flapping like a loose mainsail. With their fancy wingtips and bird-beak noses, it was child’s play for Pence to pick the union ringleaders out of the bunch, and pick them out he did, scooping them high into the air and juggling them with finesse that’d set P.T. Barnum to weeping. Round and round they went, till those New England no-goodniks didn’t know which way was left, and by the time Pence set them down, they were begging for the right to work. And that’s the true story of how Mike Pence busted a union with nothing but his own two hands. 2. When Mike Pence went fly fishing and hooked a haul of environmentalists: Well, they say Mike Pence had caught a hankering for fishing, and so’d whittled himself a tree-trunk rod, scooped up a bison for a lure, and lumbered on down to the Gulf of Mexico to see what he could see. He’d snagged himself a pair of white whales and a kraken or two when out on the horizon, he spotted a flare go up. See, a gaggle of nagsome Greenpeace works-gummers had dinghied on out to a good Christian oil rig, where they’d clambered up and chained themselves to the pump, and there wasn’t anything those poor oil workers could do to knock ’em loose. Of course, they weren’t 20 stories of pure American stock like our friend Mr. Pence! So what’s he do? First, he grabbed a passing blimp and stuck his legs through to make a pair of waders. Then he waded on out into the gulf, crossed himself for luck, and with a flick of his mighty wrist, loosed a roll cast so graceful it hooked all six of those patchouli pirates by their shirt collars. Only, once he’d reeled them in, Pence thought better of taking home such small fry, so one by one, he threw ’em back! And that’s the true story of how Mike Pence fished up a half-dozen activists on a single cast. 3. When Mike Pence played catch with a jet plane: Well, they say Mike Pence was catching sun out on an airport runway, easy as you please, when his great big ears perked up from the sound of no-good doings. A trio of brass-button executives had come strolling onto the tarmac, jawing away about the factory inspection they were off to over that big ol’ Pacific, just pleased as punch to be selling out American pride for a yen or two. But just as their Gulfstream took off and they’d uncorked a bottle of the French stuff, one hefty alabaster hand came a-grabbin’. Yes sir, Pinnacle Pence wasn’t about to let those swamp-dwellers outsource American jobs that easy, so he plucked their jet right out of a cloud and set it down gentle on the runway. Three more times they took off, and three more times Mike pulled them out of the sky, until he had those executives so steamed, their tie pins were glowing white! With no way off the ground, the billionaire bandits couldn’t close their dirty deal, leaving them stranded and American jobs secure. And that’s the true story of how Mike Pence played catch with a jet plane and won. 4. When Mike Pence danced migrant workers back to Mexico: Well, they say Mike Pence was out for a constitutional dip in that Rio Grande when what should catch his eye but a cargo truck come rumbling up from the south, stretched to bursting with inmigrantes hungry for nuestros trabajos Americanos. Folks, those pueblo Pablos ought’t’ve put on their thinking sombreros that morning before hitching their wagon to that coyote, because if there’s one thing Mike Pence hates more than finding a grizzly in his loafer, it’s a quick-fingered migrant out for our tomato dollars. The Head-in-the-Heavens Hoosier knew he had to make like a jackrabbit before they could hoof it to a sanctuary city, so he toweled off with a passing cloud and took a jog through the Smoky Mountains. Pence came on back with a Georgia fiddler in his breast pocket, and as the fiddler bowed up a whirlwind, Pence danced the jig, the hornpipe, the do-si-do, even the highland fling. With each step and stomp, his feet sent out an earth-rocking rumble that tumbled those Mexicanos back, back, back, till he’d rumbled ’em all the way back to the Yucatán! And that’s the true story of how Mike Pence danced a truckload of migrant workers right back into Mexico. 5. When Mike Pence took on an oil machine and won: Well, they say the eggheads at Exxon had ginned up a fully auto-mated oil drilling machine that’d go and go without even a drop of human sweat, and planned to replace loyal company boys with that cold steel contraption. Now, Massive Mike Pence had never much cottoned to computers—to his reckoning, when it came time to get a job done, there weren’t nothing going to do it better than two Heartland arms and an Evangelical heart—and so when testing time rolled around for that mechano-driller, he thundered up over the horizon with a wager for those Exxon men. Give him a day and a night, he asked, and if he and his brawn could drill more barrels of the black stuff than their machine, then the company would have to keep on every man they’d aimed to axe. Folk came from hither, thither, and of course yon to watch, packing picnic lunch and cider on ice, clamoring for the contest of the century. When that starting gun popped, Big Mister Pence tore so ferocious into the earth that he knocked plaster loose from the Devil’s own ceiling. Before the moles knew what’d hit ’em, he’d struck a well of Texas cola so rich, Charles Koch would have traded David for it in a heartbeat. As the sun took her arc cross the sky, that auto-drill pumped and pumped, and Pence dug and dug, till he was oil-soaked down to his gigantic Gold Toes and his heart hammered like a howitzer, and then he dug some more. The Exxon men cranked up the dial, but Pence kept pace, humming hymns all the while and giving a hearty Hail Mary for every barrel he bagged. Those few who watched it all to its grim end swore they never saw Pence pause but once, when he wiped the sweat from his brow and flicked off a drop so hefty it drowned the county’s last abortion clinic. They dug all day and they dug all night, and with dawn fast approaching, man and machine were neck and neck. And so Mike Pence pushed himself harder than he’d ever had, harder than when he’d rerouted the Mississippi to save that megachurch from hurricane floodwaters, harder even than when he’d heaved a boatload of refugees all the way back to Syria. And when they took the final tally, yes sir, he’d beat that drilling machine by a clean dozen barrels. But not even the biggest heart can take a strain like that without bursting, and as the workers cheered him, Mike Pence took one, two, three steps, and fell like a thunderclap. He’d won, but he’d paid for it with his pure and mighty soul. Yes, friends, Mike Pence died that day, but in the heart of the American worker, his legend looms larger than ever.